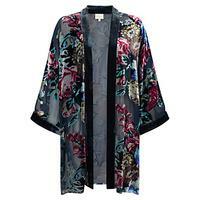 Inspired by Eastern design, this kimono from East will add an oriental edge to your ensemble. Crafted with a hint of luxuriously soft silk, this piece is decorated with a floral embroidered velvet pattern and features wide flowing sleeves and an open front that’s easy to layer. Length: 90cm The kimono style makes a very glamorous nursing cover!